In the last article we introduced you to the core features and concepts of React. We also talked about the possibility to save data in the component state, pass it to child components and access the data inside a child component by using props. In this article we will introduce Redux, which solves the problem of storing your application state. Once a component needs to share state with another component, that it does not have a parent-child relationship with, things start to get complicated. The following diagram visualizes that problem. On the left hand side, you see a tree of React components. Once a component initiates a state change, this change needs to be propagated to all other components that rely on the changed data. Redux implements the Flux pattern that manages the data flow in your application. The view components subscribe to the store and react on changes. Components can dispatch actions that describe what should happen. The Reducers receive these actions and update the store. A detailed explanation of the four parts of the flux pattern in Redux is given in the next sections. The state is immutable and the only way to change it, is to dispatch an action. Alternatively you can use an action creator, to create the action. They make the action more flexible and easy to test. In our example we use one action, to set isModalOpen variable to false or true. The question remains, how you can trigger the action. Answer: Simply pass the action to the dispatch() function. So far we can dispatch an action that indicates that the state has to change, but still the state did not change. To do that we need a reducer. The reducer contains a switch statement with a case for each action and a default case which returns the actual state. It is important to note that the Redux state is immutable, so you have to create a copy from the state that will be modified. In our projects we use the object spread operator proposal, but you can also use Object.assign(). The following example sets isModalOpen to the value of the action payload and keeps the other state values. The Reducer can either take the previous state if one exists or the optional initial state to define a default on the store properties. In our example we configure that the modal should be closed initially. The number of reducers can become very large, thus it is recommended to split the reducers into separate files, keep them independent and use combineReducers() to turn all reducing functions into one, which is necessary for the store creation. We have already talked a lot about the store, but we have not looked at how to create the store. 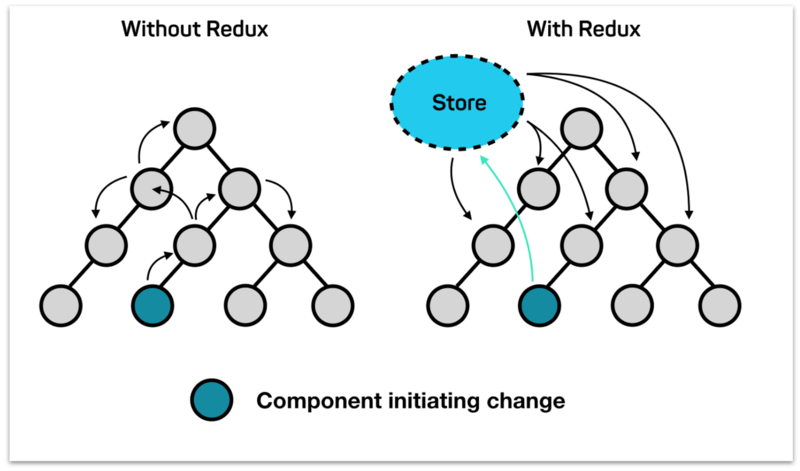 Redux provides a function called createStore() which takes the reducer function and optionally the initial state as an argument. The following code snippets show how to combine multiple reducers, before creating the store. We showed how to create and manipulate the store, but we did not talk about how a component access the store. The component can use store.subscribe() to read objects of the state tree, but we suggest to use the React Redux function connect(), which prevents unnecessary re-renders. The function connect() expects two functions as arguments, called mapStateToProps and mapDispatchToProps. Decorators are part of ES7 which we cover in blog article 5 on “ES5 vs. ES6 vs. TypeScript”. mapDispatchToProps defines which actions you want to be able to trigger inside your component. For example we want the Modal to inject a prop called onSetModalOpen, which dispatches the SET_MODAL_OPEN action. If the action creator arguments match the callback property arguments you can use a shorthand notation. mapStateToProps defines how to convert the state to the props you need inside your component. To handle the growing complexity of the store as you write business applications, we recommend to use selectors that are functions that know how to extract a specific piece of data from the store. In our small example selectors do not offer much benefit. Redux provides a predictable and transparent state, that only changes after dispatching an action. To isolate errors in your application state you can use a middleware like redux-logger instead of manually adding console logs to your code. The following code snippet shows how to configure the default redux logger. When running your React application the redux logger will print the actions to your browser console. By default you see the action name and you can collapse each action to see more details. In the details view the redux logger shows the previous state of the redux store, then the action with the payload you triggered and after that next state with the new state. Redux logger provides various configuration options. You can specify which entries should be collapsed by default, or which actions should not be logged to the console, just to name a few.